My winter teaching schedule begins January 8 & 9, 2018. Register at ccae.org and www.danforth.org. Copies Then and Now at the Cambridge Center Studio School. In this course European masterpieces of the 17th-20th centuries are used to develop both craft and personal expression. Each week we alternate between copying a masterpiece and painting from still-lifes inspired by the masterpiece. We work on refining choices of color, drawing, composition, and idea using variations of limited palettes. A selection of artists will be presented in chronological order from past to present. Changing concepts of representation of pictorial space are highlighted. Student choice of oil or acrylic. Eight sessions, January 8–March 12, 2018. 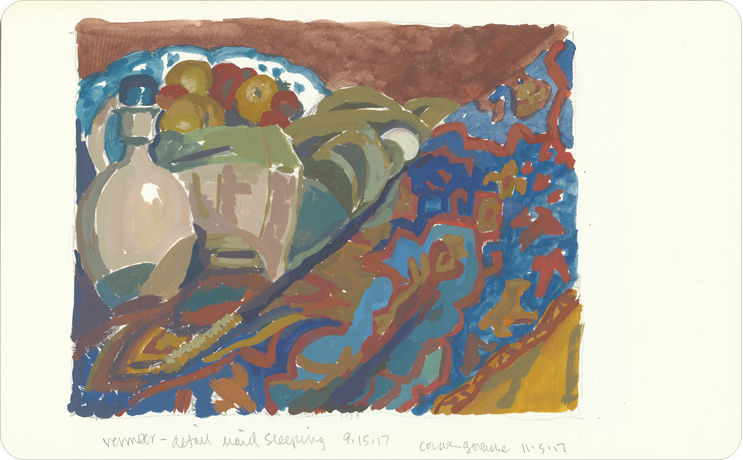 The Cambridge Center Studio School in Harvard Square was established in 1994 to provide an integrated program of observational painting and drawing. The coordinated intensive courses focus on developing skills and concepts central to drawing and painting from life. Students develop skills that enable them to respond, interpret, evaluate, and express themselves through their choice of materials. Beginning Drawing at Danforth Museum School. This class will help students gain a deeper understanding of the basic elements and principles of art while sharpening their observational skills. Students will explore a broad range of drawing ideas, including line, value, texture, proportion, composition, and expression. Six sessions, January 9–February 13, 2018. Intermediate Painting at Danforth Museum School. 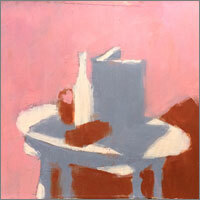 Students will develop their painting skills and concepts through observation of still-life and interiors. We will refine our awareness of color, composition, paint application, point of view, and temperament. Bring materials and tools that you normally use and a recent painting to the first class. Student choice of oil or acrylic. Six sessions, January 9–February 13, 2018. The Danforth Museum School is on Vernon Street in Framingham Center. After nearly a year of negotiations, Danforth Art Museum/School and Framingham State University have agreed to a mutually beneficial merger. Danforth Art Museum/School will become the Danforth Art Center at Framingham State University. Information about the partnership and its impact on the museum and art school can be found on the website in News/Updates. NOTE: I learned a new skill! The jpgs in this post have round corners to improve the presentation of round-cornered Moleskine pages. 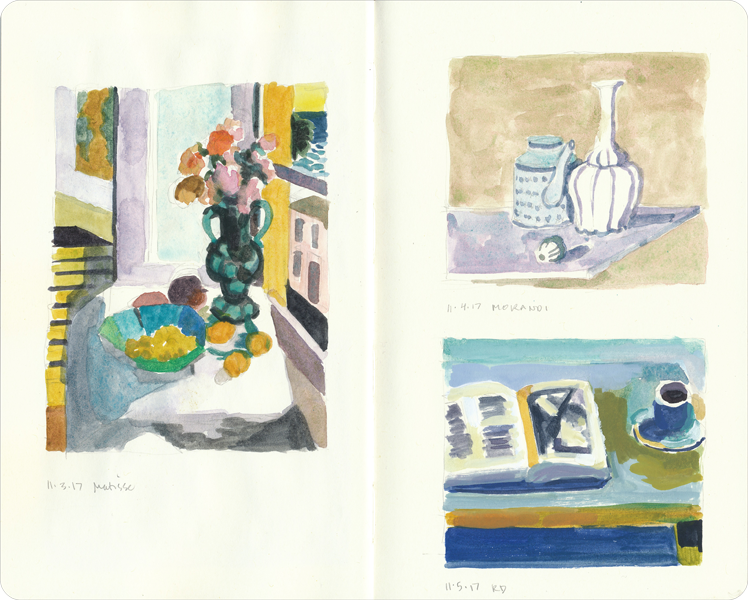 ABOVE: Copies from Matisse, Morandi, & Diebenkorn, Moleskine & gouache, 8.25 x 10 in, 2017. 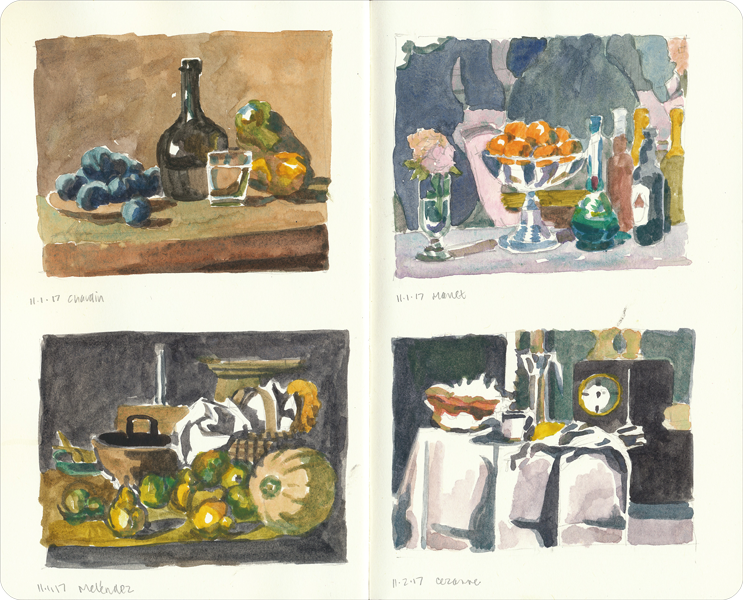 Copies from Chardin, Meléndez, Manet, & Cezanne, Moleskine & gouache, , 8.25 x 10 in2017. Detail from Vermeer’s Sleeping Maid, Moleskine & gouache, 5 x 8.25 in, 2017.